If you have a Red Throated Parrot, you have a very rare and beautiful pet bird. To raise and enjoy your bird, you must be willing to be patient, work hard, and dedicate a lot of your time. But you will be rewarded with the affection of an incredibly colorful and personable companion. Here is a guide for its care and health that will help you enjoy a long and wonderful life together. The Red-Throated Conure will thrive on fresh organic fruits and vegetables. Supplement this with a high-quality pellet mix. Table food is also good including eggs, pasta, bread, crackers. Nuts make an excellent treat when given occasionally. Don’t forget to vary their diets to keep their interest high. And try to make their food as visually appealing as possible by mixing different colors and textures. One of the most nutritious food sources is sprouted seeds. They are low in fat as they sprout and offer a different set of nutrients daily as they continue to grow. They are truly a food that keeps on giving. You can buy seeds that are already sprouted, or you can opt to do it yourself. But they are a wonderful investment in the health of your Conure. Avoid avocado, peanuts, caffeine, chocolate, rhubarb and foods that are high in sugar and salt. These can prove to be fatal. The bigger the cage, the happier your Red Throated beauty will be. The cage should be large enough for your bird to spread its wings fully in any direction that it faces. A variety of horizontal perches at different levels will allow for climbing, but they must not cramp your Conure’s ability to spread its wings inside the cage. They also need to spend several hours a day outside the cage. Providing your bird with play areas and perches outside the cage in an area that is bird safe is an excellent way to keep your bird fit, engaged, socialized, and healthy. Making a happy home for this parrot means dedicating several hours of your day each day to interact with your bird. This can include talking, petting, training, or just hanging out together as you read, pay bills, watch TV, or work on your laptop. Scheduling this time every day will increase the level of trust between bird and owner and will help your bird remain tame and relaxed around you and other family members. Because they are members of a flock in the wild, they need and expect this social interaction. By spending this time with your bird, you are more likely to avoid behavioral issues such as aggression, feather plucking, and screaming. If you are unable to dedicate at least this amount of time with your Conure, choose another bird as its companion, or rethink your choice of bird. 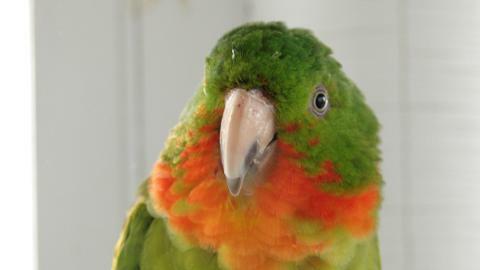 Red Throated Conures are subject to a number of diseases. And even though there is no guarantee, there are many things that you can do to lessen the chance that disease and infection will cut your Red Throated Conure‘s life short. Schedule an appointment at least every 6 months with an avian vet. Remove fresh food from the cage after an hour to reduce the chance of your bird ingesting mold and mildew that has grown on the food. Clean the cage daily to eliminate small pieces of dried droppings from becoming an airborne and potentially spreading disease. Filter your bird’s air to keep its air passages clear by removing a large number of airborne pollutants that are present with a bird in captivity. Filtering the air continuously will help your Red Throated Conure avoid respiratory infections that can be so deadly. If you are considering a Red Throated Conure, or have just recently decided to add one to your family, they will require a fair amount of your time. In return, they will give you their love and affection for possibly next 20 years. Here are 7 answers to the frequently asked question about this rare and beautiful parrot. 1. Is there any difference between the Red Throated Conure and the Red Throated Parakeet? No, this is just an alternate name for the same bird. You may also see it referred to as the Orange Throated Conure. 2. How big are they when fully grown? They average between 9 and 12 inches in length and weigh between 4 and 5 ounces. 3. How much attention do they need? You should plan to spend a minimum of several hours a day interacting one on one with this parrot. The more you socialize with your parrot, the more chance you stand of avoiding biting, screaming, and feather plucking. It is easier to avoid these behaviors than it is to redirect them once they have become a habit. And if your Conure becomes emotionally unhealthy, deterioration of physical health often follows and often opens the door to disease and infection which can ultimately shorten the life of your companion. 4. What kind of cage is best? A stainless steel cage is the best overall choice. It is an expensive cage, but you will only need to purchase one of them because they will last for the lifetime of your bird. The cage should be large enough to allow your Conure to fully expand its wings in any direction inside the cage. The cage should also contain a variety of toys, perches at different levels, and bar width that is narrow enough to prevent your bird from getting its head caught between them. 5. What's the best way to find an avian vet? One of the best ways is by word of mouth. There are many bird related bulletin boards, forums, and chat rooms. Become a member, join in the discussions, and post your questions. People are more than happy to share their personal recommendations about vets that they have found helpful. Your breeder is also an excellent resource for finding a vet. 6. How loud are they? On a scale from 1 to 10 with 10 being really noisy, Conures generally approach an 8. They make loud screeching sounds that can eventually become distracting at best. Again this is a generalization, and you should keep in mind that each bird is different. Using a cage cover that does not let in light will help delay the noise until you remove it in the morning. If you are still on the fence about a Red Throated Conure, spend some time around the bird to get some idea of how loud the bird you're interested in really is. Then access, whether you think all in your family, will be able to tolerate this for the next 20 years or so. If the answer is yes, you've found a friend for life. 7. What type of air purifier is safe for my Conure? A high-efficiency particle arresting (abbreviated as HEPA) air purifier is safe, efficient, and economical. It is designed to run 24 hours a day to stay ahead of and remove particulates that can clog your bird's air passages. These particles include feathers, dust, bird dander in addition to those that are found in the average home-- dust, mites, mold and mildew spores, bacteria, and viruses. A HEPA air purifier is capable of removing bird dander as well as other fine particulates and produces only fresh clean air. A bird dander air purifier can literally add years of life to your Red Throated Conure and you.